Journalist takes magnifying glass to reports about 300,000 protesters, says real number is about 65,000. A journalist has taken a magnifying glass to press reports that said 300,000 Israelis participated in Saturday night's protest against current economic policies. He accuses fellow journalists of inflating the real numbers fourfold. 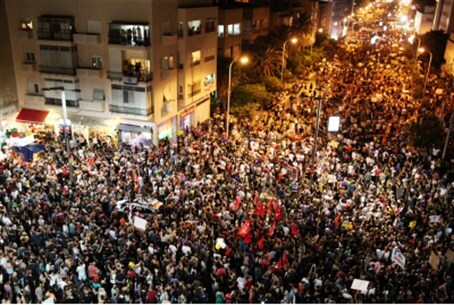 The protest in Tel Aviv was the largest one. Leading television and Internet news outlets proclaimed that there were close to 300,000 people there. Ma'ariv's Uri Radler calls this claim "physically impossible." The length of Kaplan Street in Tel Aviv, where the protest took place, is 564 meters, he explains, and its average width is 30 meters, sidewalks included. The total area of the central protest was close to 17 dunams (over four acres and close to 17,000 square meters). Crowd density was low – especially at the sides of the road. Therefore the reasonable estimate of the number of protesters in Kaplan Street is about 50,000. Several thousand people stood in adjoining streets, and others came and went. All in all, he says, there were 62 to 65 thousand people in Tel Aviv's protest. The estimate by Ynet – that said there were 250,000 people in the protest – was about four times larger than the truth, Radler noted. In Jerusalem, Ynet reported 30,000 protesters in Paris Square. Radler says he took a Flash 90 photograph of the crowd and counted the people, one by one. He reached 2,457. Even taking into account that some protesters are outside the frame, and others came and went – the total number cannot reasonably be estimated at more than 5,000. Radler mocks Israeli press for trying to create a story out of what he says is closer to a non-story. "There is a protest next week, too," he notes acerbically. "What will we do then?... Shall we build a story about 500,000 people when in fact there will be 50,000? What the about the next week, and the week after? When will we reach the point at which 100 million Israelis take to the street?"